A series of explosions rocked two normally quiet coastal government strongholds in Syria Monday, killing more than 80 people and wounding 200 others, state media and opposition activists said. The Islamic State group claimed responsibility for the attacks. 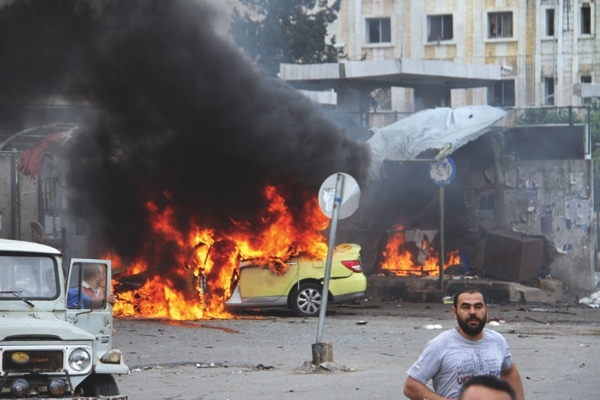 The deadly blasts in the peaceful pro-government cities of Tartus and Jableh were the first of their kind targeting civilians in those areas during Syria’s civil war, now in its sixth year. The targets included bus stations and a hospital, and marked an escalation in the conflict as world powers struggle to restart peace talks in Geneva. Several rounds of peace negotiations were held in the Swiss city earlier this year, although there was no breakthrough and the talks never really took off. The TV reports said at least one suicide bomber, followed by a car laden with explosives, tore through a packed bus station in Tartus, minutes apart. More than 33 people were killed and many injured in the bombings. Separately, Syria’s SANA news agency reported that four explosions rocked Jableh, south of Latakia city. The attacks included three rocket strikes, and a suicide bombing at the emergency entrance of the Jableh national hospital, state media said. Jableh News Network, an opposition activist media group, said that one of those killed at the hospital is a nurse, Huda al-Houshi. Footage aired by the state-run Ikhbariya TV showed several cars on fire and thick black smoke billowing in the air. It also showed the charred remains of cars and minivans in what appears to be a bus station in Jableh. Russia keeps a naval base in Tartus and an air base in Latakia province. Insurgents maintain a presence in rural Latakia. The coordinated and near-simultaneous attacks marked a major security breach of government strongholds that have remained calm throughout the war. Tartus and Jableh are home to thousands of internally displaced people from violence-­stricken areas across Syria. The bombings unleashed an immediate backlash against the refugees, with families of the victims attacking IDP shelters. One shelter, al-Karnak, was burned down. The Syrian Observatory for Human Rights, an opposition monitoring group based in Britain, put the death toll at more than 100. It said that seven explosions ripped through both locations simultaneously: four in Jableh, including three suicide bombings and one car bomb, and three in Tartus, including two suicide bombings and one car bomb. It said that in Jableh, dozens were killed when a car bomb went off near a bus station, followed by a suicide bomber who detonated his explosive belt inside the station. Meanwhile, two men blew themselves up at the electricity company and outside the emergency entrance of a city hospital. Dozens more were killed in Tartus when a car bomb went off in the bus station, and then two men blew themselves up when people gathered, according to the Observatory. “We will not be deterred […] we will use everything we have to fight the terrorists,” said Syrian Cabinet Minister Omran al-Zoubi on Syrian TV. A news agency linked with the Islamic State group said the group’s militants were behind the multiple attacks.